Me - Charlie and the Chocolate Factory was very different from the movie Willy Wonka and the Chocolate Factory. It was also very different than the Johnny Depp movie Charlie and the Chocolate Factory. It was a lot darker than either of those. I didn't really like the changes. I did like some of the new songs, however. They also still had some of the songs from the movie which I like too. The acting was good. The singing was good. The dancing was good. The sets and costumes were very colorful. I love that there was a lot of purple because purple is one of my two favorite colors. I liked the first act of the show better than the second act. The second act was much darker than the first act. Even though little kids would probably want to see this show because of the movie, i is not really a good show for little kids. There are parts of the show that might scare them. Also, if you really love the movie, you will probably not like the show. However, adults and children who like scarier things might enjoy it. Mom's view - If you are looking for a carbon copy of the beloved 1971 movie, Willy Wonka and the Chocolate Factory, you will not find it in the Broadway show, Charlie and the Chocolate Factory currently running at the Lunt-Fontanne Theatre. This version is much darker; darker even than the 2005 Johnny Depp led remake. You will find some of old familiar songs in this version including Pure Imagination and The Candy Man although not all of those songs. For instance, the show does not include all the original Oompa Loompa songs. There are also a whole bunch of new songs. Some of them are fun and memorable. Others, like the new Oompa Loompa songs are not as good as the songs from the original movie. Christian Borle does a good job of playing the lead role of Willy Wonka although the character is written even less warm and fuzzy than in the movie, and he certainly wasn't warm and fuzzy in that version. The rest of the acting is mostly good. The role of Charlie is shared by three young boys. We saw Jake Ryan Flynn, and he was charming in the role. However, the fact that the other children's roles are played by adults only seems to add to the darkness of the show. I wouldn't recommend the show for very young children because some parts of the show might be too scary for them nor would I recommend it for anyone who is particularly sentimentally attached to the original film. However, if you want to see a somewhat different version of the story or if you thought the original was too sacchrine than you may enjoy it. For more information or to purchase tickets visit www.charlieonbroadway.com. Tuesday Mini Scoop - iPlay America's Twelve Days of Fun! Starting today and running for the next TWELVE days iPlay America is running a new giveaway promotion called Twelve Days of FUN! This contest is open to anyone 13 years or older and each day a new prize will be revealed and a winner announced. The prizes include Gift Cards, Ride Passes, Show Tickets, Gift Baskets and one lucky winner will receive an iPlay America Birthday Party. Me - The High Line Tour was interesting. The High Line is park where there used to be an elevated railroad as matter of fact, you can still see some of the tracks We learned a lot about the High Line on the tour. I had only been there once before but I didn't learn much about it then so even though I'd already been there before I learned a lot that I didn't know then. The tour took us through almost all of the High Line but not quite all. We saw lot of flowers on the tour. There were all kinds of different flowers. There were also a lot seats and benches. There were movable chairs. There was an area where you could sit and look down and watch the cars going by. There are some buildings. You can walk right under them. There is even a hotel. One of the buildings used to be the Nabisco Factory. There was a lot of artwork on the High Line The artwork is not always the same. Most of the artwork on the High Line is only their for a limited time. It was cool to look out and see the views from the High Line. It was very high up so there were very nice views. My favorite part of the tour was learning facts about the High Line and seeing the scenic views. People who like nature and being outside would enjoy the High Line Tour. Mom - Even with all the many parks located within New York City, the High Line is different. It is built above the street on what used to be an old train line. It is not a park with playgrounds or people riding bikes or playing sports. It is more a park for walking and relaxing and enjoying nature. You will see kids playing, but often in ways that are only possible because of the uniqueness of the location. You will also see beautiful colorful plants; some growing over and around railroad ties which are a reminder of the site's former use. You will see large wooden rolling loungers where you can sit or lie out with a good view of the river. You will see the Urban theater where you can sit and watch the cars go by below. You will see the old Nabisco Factory and the Standard Hotel and other buildings that you can walk underneath because they are elevated over the park. These are just a few of the unique aspects of this fascinating place. For a true overview of the park and to learn more about the history of this unique venue, we recommend a High Line Tour. On a High Line Tour, you will not necessarily travel the entire length of the High Line, but you will travel most if it. High Line Tours are given for free by Friends of the High Line. They take place on Tuesdays at 6:30 PM or Saturdays at 10:00 AM from May through October. Reservations are not required but tours fill up fast so keep that in mind if you are interested in a tour especially since tours are only given twice a week. While the tours are not really for young children, the High Line itself is a great place to take kids. Aside from the many places for them to play and have fun along the High Line, there are also interactive activities and art classes for kids on the High Line. There are activities and cultural events for teens and adults as well. It is definitely a place where there is an activity and/or a location that will interest just about everyone. For more about the High Line, The High Line Tour, and/or upcoming events taking place at the High Line go to https://www.thehighline.org/. We have been given access to an issue of Kazoo Magazine for review purposes. This post may also contain affliate links, If you click on a link and make a purchase, we will be compensated. Any and all opinions expressed here are our own. Me - Today I am recommending Kazoo Magazine. There are many different types of things you can find in this magazine, such as, crafts, recipes, small articles, puzzles, how-tos, comics, and stories. Just by looking at it, you can tell that this magazine would be a lot of fun. It is focused on girls and young girls would love this magazine. Mom - Today I am also recommending Kazoo Magazine. Kazoo Magazine is a magazine for girls ages 5 to 10. Each issue is not very big but they are all full of fun. The magazine is packed with interesting articles, entertaining stories, games, crafts, recipes and more that are meant to empower girls and make them feel good about themselves. Each quarterly issue revolves around a particular theme. Recent themes have included music, flight and nature. It is definitely a magazine that any young girl would love. 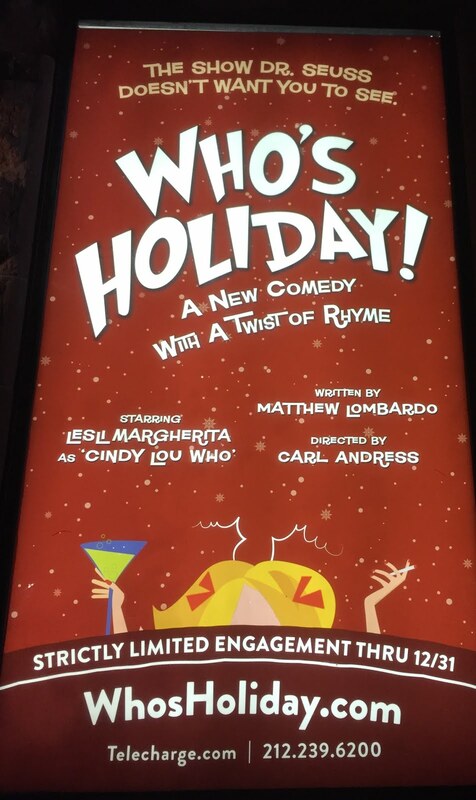 Monthly Mash-up for November, 2017 Me: Backstage at the Longacre Theatre and Mom: Who's Holiday! Me - My topic for this month is backstage on Broadway. I recently got to go backstage at another Broadway theater. This time it was the Longacre Theatre. Currently, A Bronx Tale is playing there. I haven't actually seen that show but a friend of ours was working backstage at the show so he took us backstage after a performance. We met him at the stagedoor. Some people were standing there after the show wating for autographs when our friend took us backstage. That was so cool ! I have always wanted to do that ! We got to walk backstage. We walked on the stage. We took pictures. We saw the car they use in the show. It looked really small. We saw a bunch of other props that they use in the show too. The guy that wrote the show was there. His name is Chazz Palminteri. He said hello too us. That was cool! The kid that is in the show was there too. He was taking pictures on the set with some people. It was a really fun experience! Me - My topic for this month is Who's Holiday! Although this show is based on the the classic children's book, How the Grinch Stole Christmas, this show is definitely not for children. The show is a continuation of the beloved tale in which Leslie Margherita, perhaps best known for her role as Mrs. Wormwood in Matilda, plays a grow-up version of little Cindy Lou Who. Life hasn't been so easy for Cindy Lou, and she isn't afraid to share all the gory details of her sordid life. The show is actually quite funny if you don't mind thinking about beloved children's characters in a new and unflattering light. Ms. Margherita is terrific in the role. She really does a good job of getting into the characters skin and she is very responsive to her audience and quick with an adlib when one is suitable. The show is told in rhyming couplets just like the Dr. Seuss book on which it is based, a device which alternates between being cute and endearing and cloying and annoying. All in all, though it's a fun and somewhat nostalgic show. Who's Holiday is currently playing at the West Side Theatre, 407 W. 43rd St. New York, NY. It will run through December 31, 2017. 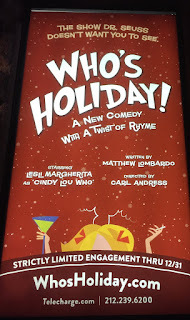 For more information or to purchase tickets visit whosholiday.com. And thats our view. What's on your mind? This one-hour adaptation of The Wizard of Oz, the classic tale by L. Frank Baum that has been entertaining audiences for ages, features the Munchkins as puppets and is tailored for audiences 2-7 years old. Rediscover the joy of following the yellow brick road with Dorothy, the Scarecrow, the Tinman, and the Cowardly Lion as they travel through a reimagined world of Oz. For more information or to purchase tickets visit vitaltheatre.org/oz. Following Her recent sold-out Broadway run, God arrives in New Brunswick and she looks a lot like Kathleen Turner! Called “deliriously funny” by The New York Times, God takes human form in "An Act of God" and doesn’t hold back about what She’s seen and heard. In this hilarious comedy by Emmy Award-winner David Javerbaum ("The Daily Show with Jon Stewart"), God, along with two archangels (Stephen DeRosa and Jim Walton), answer many of the deepest (and not so deep) questions that have plagued mankind since Creation. Carolers, History Makers and a tree lighting ceremony will signal the start of Historic Holiday Nights at the Betsy Ross House. Meet Betsy Ross, hear holiday favorites performed by costumed carolers, and get the first peek at the new Old City District Design Tree. The Old City District Design Tree is an artistic lighting installation designed by FK Productions, and celebrates the season with a nod to the neighborhood’s strong history of art and design. Visitors can enjoy $1 off admission at the Betsy Ross House, which will offer extended hours until 8 p.m.
Old City District and the Betsy Ross House are teaming up to present Historic Holiday Nights in Old City. Weekly performances are planned in the House’s courtyard. Visit the museum shop for unique gift items for every shopping list and take evening tours of the iconic site. In addition, participating boutiques, shops, art galleries, historic sites, museums, restaurants and cafes around the neighborhood will treat visitors to extended hours, special sales, discounts, promotions and menu items. Betsy’s Birthday Bash celebrates the January 1, 1752 birth of America’s most famous flag maker with crafts, entertainment and, at 1 pm, cake courtesy of City Tavern. FREE. For more information about upcoming events at the Betsy Ross House visit historicphiladelphia.org/betsy-ross-house/betsy-ross-upcoming-events. Sly, sassy and sporting a whole lot of ferocity, Alexa Bliss has been a fierce competitor her entire life and NOW her fiercely devoted fans can see her LIVE at iPlay America. As a SmackDown LIVE competitor, she ascended to the top of its Women’s division to become a two-time SmackDown Women’s Champion. Weeks after joining Monday Night Raw in the Superstar Shake-up, Alexa made history at WWE Payback, reigning supreme over Bayley in a hard-fought contest to become the first Superstar to win both the SmackDown Women’s Championship and the Raw Women’s Championship. Tickets are on sale NOW. For more information or to purchase tickets, visit iplayamerica.com/event/wwe-superstar-alexa-bliss. iPlay America wants your help to kick off the holiday season by helping others! Join us on December 2, for iPlay America’s Pointsettia Toy Drive with 94.3 The Point to benefit the Emmanuel Cancer Foundation! Please bring an unwrapped toy that will be given out via the Emmanuel Cancer Foundation to local children this holiday season. While you are here, please join us for FREE photos with Santa and FREE entertainment from YouTube sensation, Backtrack Acapella! This event is FREE, but let us know you are coming by downloading a ticket! Performances by Backtrack Acapella will take place at 12:30, 1:30, 2:30 and 3:30. The Kids Holiday and Health Fair presented by Hackensack Meridian Health is happening at iPlay America’s Warehouse 100 on Sunday, December 3 from 10:00 a.m. to 4 p.m. This FREE event will give families the chance to experience holiday shopping, entertainment and healthcare information sessions, all under one roof will feature doctors and departments from Hackensack Meridian Healthcare, local vendors to shop with, as well as live entertainment with popular children’s entertainers Miss Sheri and Jungle Jim. Guests are encouraged to bring their favorite teddy bear and other stuffed animals for the Hackensack Meridian Health Teddy Bear Clinic. Have the kids bring their cuddly friends to be checked out by the doctors and staff to be sure they are in tip-top shape. iPlay America welcomes the “Queen of Children’s Music” Laurie Berkner and the Laurie Berkner Holiday Show to iPlay America’s Event Center for two fun-filled performances on Sunday, December 3. Laurie and her longtime collaborators Susie Lampert, Bob Golden and Brady Rymer — the “band” — celebrate the holiday season with traditional classics like Jingle Bells and Frosty the Snowman, plus originals from Laurie’s well-loved album A Laurie Berkner Christmas like Santa’s Coming to My House Tonight. Laurie and the band will pay tribute to Hanukkah with Candle Chase and The Dreidel Song. They’ll also perform an array of Laurie’s greatest hits, such as We Are the Dinosaurs, Victor Vito and Pig on Her Head, along with several soon-to-be-classics from Laurie’s new album, Superhero. The first show starts at noon; doors open at 11:00 a.m. The second show starts at 4:00 p.m. and doors open at 3:00 p.m.
For more information or to purchase tickets, visit iPlayAmerica.com/Event/Laurie-Berkner-Holiday-Show. Celebrate the holiday season with the world premiere of Jason Bishop: Believe In Magic. Back by popular demand after a sold-out run last season with Jason Bishop: Straight Up Magic (New Vic, 2016), the internationally-touring magician returns with new, jaw-dropping tricks designed especially for a festive engagement at The New Victory. With consultation from Broadway’s famed illusion designer Jim Steinmeyer (Pippin, Into the Woods, Disney’s Aladdin and Mary Poppins), Believe In Magic will showcase Bishop’s breadth of talents in a mix of sleight of hand and exclusive, full-stage illusions. The world premiere of Jason Bishop: Believe In Magic will be at The New Victory Theater December 1 - 30, 2017. From making one million dollars in cash vanish in the “$1,000,000 Challenge” to creating “Human Origami” out of his assistant, Kim Hess, Jason Bishop returns with new acts designed especially for The New Victory. Bishop’s quick wit and engaging audience participation make each performance unique. Every show packs in more than a dozen acts with one remarkable illusion after another. And then, when he guesses an audience member’s wish list and suddenly makes it snow, Believe in Magic will have you believing in the holiday spirit, too! Bishop is a regular guest on “Masters of Illusion” on the CW Network, the “TODAY Show” on NBC and “Cabaret Du Monde” in Paris, France. He has also performed at the world-famous Magic Castle in Los Angeles. The youngest person to win the Magician’s Alliance of Eastern States Stage Award and one of the youngest individuals to compete in The Society of American Magicians national competition, this masterful illusionist performs an average of 150 shows per year and has traveled to 48 states, as well as 30 countries on six continents. Bishop and Hess are joined on stage by their canine companion Gizmo. For more information or to purchase tickets, visit NewVictory.org. Mayor Frank Huttle III is hosting the 8th Annual Englewood Tree Lighting. The program will take place in front of City Hall at 7pm and will feature a visit from Santa and his Elf and performances by St. Paul’s Choir School, The Performing Arts School at bergenPAC and Dwight Morrow High School and the Academies@Englewood Tri-M Music Honor Society. The Mayor also continues the tradition of inviting 160 youth to the performance of The Nutcracker. There will be hot chocolate from Starbucks and cupcakes from Cupcakes by Carousel. An evening celebrating the diverse cultural heritage of Asia Minor and ancient Byzantium expressed in folk songs, carols and hymns performed by the Archdiocesan Youth Choir and Byzantine Choirs accompanied by traditional instrumentalists. Works by Klein, Beethoven and Shostakovich. An Ensembles concert provides an intimate connection between musician and audience. Experience the passion and personality of the performers! For more information or to purchase tickets, visit www.kaufmanmusiccenter.org/mch/event/new-york-philharmonic-ensembles. At this special Book Club event, Emmy Award-winning actor, magician, director, and author Neil Patrick Harris celebrates his middle-grade debut novel, The Magic Misfits. This delightful book takes the reader on a whirlwind adventure of family, friendship, and illusion sprinkled with real magic tips and tricks. Neil Patrick Harris is an accomplished actor, producer, director, host, author, and father of six-year-old twins. Harris also served as President of the Academy of Magical Arts in 2011-14. His memoir, Choose Your Own Autobiography was a New York Times bestseller. Note: There will not be a book-signing after the event. Signed books will be available for sale. Theater fans have only a few weeks left to catch the off-Broadway sensation Spamilton, as producers announced today the show will play its final performance on January 7, 2018. Spamilton originally started as a limited engagement in July of 2016 and, after multiple extensions, continued on to play at The Triad Theater and then the 47th Street Theater / Puerto Rican Traveling Theater totaling well over 500 performances. For more information and or to purchase tickets, visit www.spamilton.com. 59E59 Theaters (Val Day, Artistic Director; Brian Beirne, Managing Director) is thrilled to host CROSS THAT RIVER, a new musical composed by renowned jazz artist Allan Harris, with a book by Mr. Harris & Pat Harris, and directed by Regge Life. Produced by Love Productions Records, CROSS THAT RIVER begins performances on Thursday, November 30 for a limited engagement through Sunday, December 31. Press Opening is Wednesday, December 6 at 7:15 PM. The performance schedule is Tuesday – Thursday at 7:15 PM; Friday at 8:15 PM; Saturday at 2:15 PM & 8:15 PM; and Sunday at 3:15 PM. Performances are at 59E59 Theaters (59 East 59thStreet, between Park and Madison Avenues). The unsettled West of the 1860s provides a new life and new dreams for Blue, a runaway slave who escapes to Texas to become one of America's first Black Cowboys. This compelling tale of freedom integrates fiction with historical fact, and each song presents a different page in this complicated chapter of American History. To purchase tickets, call Ticket Central at (212) 279-4200 or visit www.59e59.org. In what has become an "enjoyable tradition during the holiday season" (The New York Times), Ballet Hispánico in collaboration with the Apollo Theatermakes its annual return to the Apollo stage on December 1-2, 2017, led by Eduardo Vilaro. Three inspiring works reflect on the migrant experience, the tragedy of marginalization and the resilience and triumph of the human spirit to capture contemporary Latino culture through movement. The performances are supported by Goya Foods, Lead Sponsor of Ballet Hispánico. Con Brazos Abiertos (2017) choreographed by Michelle Manzanales, is an exploration of iconic Mexican symbols that she was reluctant to embrace as a Mexican-American child growing up in Texas. Intertwining folkloric details with a distinct voice, set to music that ranges from Julio Iglesias to rock en español, the piece is a fun and frank look at a life caught between two cultures. Espiritu Vivo (2012) an exciting collaboration between Ballet Hispánico and Brooklyn-based choreographer Ronald K. Brown, explores the intersection of the African and Latino diasporas in the Caribbean and Latin America. Finally, choreographer Ramon Oller's Bury Me Standing (1998) was inspired by the unique culture of the Gypsy or "Roma" people, a marginalized community that has journeyed across continents for thousands of years. Additional programs at the Apollo Theater will include special Ballet Hispánico Performances for Young People / Apollo School Day Live shows of mixed repertory for schoolchildren. Ballet Hispánico's Performances for Young People (PYP) are interactive 50-minute productions that delight students with a guided exploration of Latin American dance forms and music. Apollo School Day Live provides new generations of theater-goers with exciting opportunities to learn about the arts, history and culture. Tickets for the evening shows are $10-65 and are available online at Ticketmaster.com, by phone at (800) 745-3000, or in person at the Apollo Theater Box Office at 253 W. 125th Street, NYC. For more information, visit www.ballethispanico.org. Making her feature debut, filmmaker Stéphanie Di Giusto explores how Fuller (played by musician and actress Soko) escaped the Midwest to transform herself, first by pursuing acting but then developing into a celebrated avant-garde dancer in New York, eventually making her way to the prestigious Paris Opera. Fuller's influential Serpentine dance routine cemented her legend, but soon she faced stiff competition from a rising star named Isadora Duncan (a luminous Lily-Rose Depp. Time Lapse Dance Artistic Director Jody Sperling, who is the preeminent exponent of Fuller's dance style, was choreographer, creative consultant, and coach for the film. Sperling worked intensively with the film's star, the French singer/actress Soko, training her 5-6 hours per day for a period of 5 weeks helping her embody the role of "La Loïe." The film garnered six César Award nominations, including a win for Best Costume Design. The Dancer premiered at the 2016 Cannes Film Festival in the "Un Certain Regard" category and made the NYC debut at Lincoln Center Film Society's Rendez-Vous with French Cinema Festival in March 2017. Works & Process at the Guggenheim presents Sergei Prokofiev's charming children's classic Peter & the Wolf. Isaac Mizrahi directs, designs, and narrates Sergei Prokofiev's charming children's classicas Brad Lubmanconducts Ensemble Signaland a cast performschoreography by John Heginbotham, bringing the 30-minutestory to life for the young and young at heart.
. For children 5 and up. Enter via the ramp at 88th Street and Fifth Avenue. British playwright Torben Betts arrives from across the pond to attend a performance of his play Muswell Hill, which is enjoying its New York Premiere in a co-production between The Barrow Group Theatre Company (Seth Barrish and Lee Brock, Co-Artistic Directors; Robert Serrell, Executive Director), and The Pond Theatre Company at The TBG Theatre (312 West 36th Street), and to take part in two special surround events related to the production. On Tuesday, November 28th at 2:30pm, Mr. Betts will be at The Drama Book Shop (250 West 40th Street – between 7th & 8th Avenues) to participate in a Q&A with members of the cast to discuss Muswelll Hill, as well as his distinguished career. It will be moderated by Lily Dorment, Co-Founder of The Pond Theatre Company. The event is free of charge. To RSVP, please email info@thepondtheatre.org. Mr. Betts will attend the show on Wednesday, November 29th at 8pm, and immediately following the performance participate in a post-performance discussion, moderated by playwright Arlene Hutton. The talk back is free of charge to ticket holders. Performances began November 11, 2017 for a limited engagement through Saturday, December 16, 2017 at The Barrow Group Mainstage Theatre (312 West 36th Street, 3rdFloor). Opening Night was celebrated on Monday, November 20, 2017 at 7:00PM. Set in the leafy north London suburb of Muswell Hill, a dinner party turns dangerously fraught, yet increasingly comical, as the host and guests rattle their upper middle class complacency to a point of no return. Amidst this domestic disaster, an earthquake in a developing nation rocks the rest of the world. How can they justify their everyday worries in an ever more fragile world? Muswell Hill will play the following performance schedule: Monday at 8:00 p.m., Wednesday through Saturday at 8:00 p.m., and Sunday at 7:00 p.m.
Amas Musical Theatre (Donna Trinkoff, Artistic Producer) in celebration of its 49th season, will present Dare To Be Different, a series of three new musicals and three one-night only special events from November 30 - December 15 at A.R.T./New York Theatres (502 West 53rd Street - 10th Avenue & 53rd Street). A True Civil War Adventure with Historical Music, by Scott Winfield Sublett, directed by Christopher Scott. The story of Robert Smalls, the slave who stole a Confederate gunship and inspired Abraham Lincoln to open enlistment for Black soldiers in the Civil War. Book, lyrics and music by Robert Mitchell. Often referred to as "The Black Marilyn Monroe", Dorothy Dandridge, the first of her race to be nominated for an Academy Award for Best Actress, boldly cleared a path for generations to come. Starring N'Kenge (originated Mary Wells, MOTOWN: The Musical). 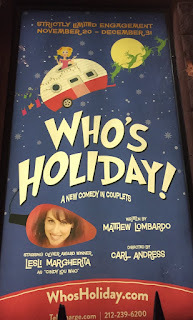 Book and lyrics by Jill Abramowitz, music by Brad Alexander, directed by Melissa Crespo. Based on the film inspired by true events, BREAD AND ROSES is the story of a young undocumented Mexican woman who crosses the U.S. border and risks it all in her fight for a living wage, equality and justice. Michael LaMasa and his alter ego Dottie journey through the Great American Songbook with a little help from her friends in this jazz comedy variety show.. Only one performance! A SPECIAL "BLAST FROM THE PLAST" BENEFIT CONCERT - ONE PERFORMANCE ONLY! Meet Wanda, the coolest tween ever. She's beautiful. She's confident. And she's the star of her own TV Talk Show! That's the fantasy. In reality, Wanda has a blotchy issue of her own to overcome. And tomorrow is the first day at a new school ... IT'S GOING TO BE AN AWESOME YEAR! A musical reunion featuring Academy members from a few of the 42 years our flagship youth program has been in operation. Music direction by Evan Alparone. All the events are priced between $20-$40. Become an "Amas49er" member to receive a 50% discount. For tickets please call (212) 352-3101 or visit the brand new Amas web site at www.amasmusical.org. Houses on the Moon Theater Company (Emily Joy Weiner, Co-Founder & Artistic Director; Kevin Connor, Managing Director), as part of the inaugural season of Next Door at New York Theatre Workshop, will present the return engagement of the acclaimed documentary play DE NOVO written and directed by Jeffery Solomon (Tara's Crossing) originally produced by the company in 2010. Original cast member Emily Joy Weiner (Coming Through) will be joined by Camilo Almonacid (The Assignment) and Zuleyma Guevera (Uncommon Sense). Performances are set to begin Friday, December 1, 2017 for a limited engagement through Friday, December 22, 2017. The production is being staged at New York Theatre Workshop's Fourth Street Theatre (83 East 4th Street). Opening Night is Thursday, December 7, 2017. Houses on the Moon presents its acclaimed production of DE NOVO, which tells the true story of a teenaged boy from Guatemala who faced deportation after fleeing to the U.S. to escape gang life. The gang MS13 was the only family Edgar Chocoy had ever known, but he dreamed of a better life. At fourteen, he fled Guatemala City and travelled over 3,000 miles, across the borders of three countries in search of his mother, who left him when he was a baby to find work in the United States. Detained by the Department of Homeland Security, he pleaded with a Colorado judge not to deport him to Guatemala, where the gang he left had sentenced him to death. This documentary play is crafted entirely from immigration court transcripts, letters, and extensive interviews conducted by Houses on the Moon company members in Los Angeles, Colorado and Arizona at Southwest Key, the largest facility for detained immigrant minors in the United States. DE NOVO is augmented with projected images from Donna DeCesare, an award-winning photojournalist who is widely known for her groundbreaking coverage of the spread of Los Angeles gangs in Central America. DE NOVO provides a rare glimpse into the life of an "unaccompanied alien minor," thousands of whom make the dangerous journey across the border and through the U.S. justice system each year. Though there are thousands of foreign-born minors in U.S. custody; barriers of language, age, class, culture, and law conspire to make this population invisible to many. Their stories of migration are poignant, heroic and painful. They deserve to be heard. DE NOVO will play the following performance schedule: Mondays at 7:30pm, Wednesdays at 7:30pm, Thursdays at 7:30pm, Fridays at 7:30pm, Saturdays at 3:00pm and 7:00pm, and Sundays at 3:00pm. The York Theatre Company (James Morgan, Producing Artistic Director; Evans Haile, Executive Director), dedicated to the development of new musicals and preserving musical gems from the past, will honor legendary musical theatre writing team Harvey Schmidt and Tom Jones (The Fantasticks, I Do, I Do!, 110 in the Shade, Celebration) with the 2017 Oscar Hammerstein Award for Lifetime Achievement in Musical Theatre at the 26th Oscar Hammerstein Award Gala to be held on Monday evening, December 4, 2017 at The Asia Society (725 Park Avenue). The VIP Reception begins at 6:00 p.m. Richard Jay-Alexander (Les Misérables) will direct the concert and award ceremony, which begins at 8:00 p.m. Music Director is Andrew Gerle. For additional information, pricing and reservations, please contact Director of Development Ellen Weiss at (212) 935-5824, ext. 214 or eweiss@yorktheatre.org. And that's the scoop. Tune in tomorrow for this month's monthly mashup.